PESHAWAR, Pakistan (AP) — Bombs that exploded outside two mosques in a village in northwestern Pakistan killed at least 13 people Friday, underlining the challenge of militant violence facing a new government set to take power under the leadership of former Prime Minister Nawaz Sharif. The blasts at the two Sunni Muslim mosques also wounded 45 people, said tribal police officer Badshah Rehman. Both of the mosques were badly damaged, and the roof of one of them collapsed. The mosques were located in Baz Darrah village in the Malakand district of Khyber Pakhtunkhwa province, Rehman said. Shahid Ali, who was in the first mosque that was attacked, said the explosion came just as worshippers were starting Friday prayers. "I rushed out with others and saw several people bleeding and crying," Ali told The Associated Press by telephone. "There was dust and smoke around." Ali rushed to the second mosque after it was attacked and saw that its roof had caved in and it was on fire. "Many people are buried under the rubble," he said. Rescue workers were trying to retrieve the dead and wounded from the debris, Rehman said. No one has claimed responsibility for the blasts, but suspicion will likely fall on the Pakistani Taliban. The Sunni militant group has been waging a bloody insurgency against the government for years that has killed thousands of civilians and security personnel. The militants have attacked Sunni mosques in the past, perhaps because the worshippers did not follow their extremist brand of Islam. The Pakistani army has mounted multiple operations against the militants in the northwest, but they have proven resilient and continue to carry out near-daily attacks. The Taliban recently launched a series of attacks in the run-up to national elections on May 11 in an attempt to derail the vote. Pakistanis defied the militant group by coming out in large numbers to cast their ballots. 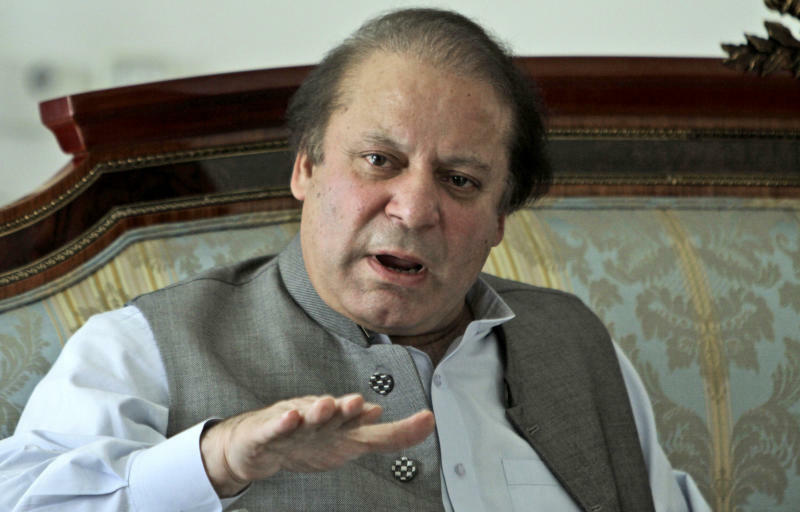 Sharif's Pakistan Muslim League-N Party was the big winner in the election and appears set to form the next government. The Pakistan Tehreek-e-Insaf Party, led by former cricket star Imran Khan, is expected to form the provincial government in Khyber Pakhtunkhwa. Both politicians have called for negotiations with the Taliban, and Khan has even said that Pakistani troops should stop battling the militants and pull out of areas of the northwest. Now he will face the challenge of applying his election platform to the challenges of governing one of Pakistan's most violent areas. Sharif's government will also face the challenge of turning around Pakistan's economy, which is hampered by power outages that last up to 18 hours a day in some parts of the country. Pakistan has turned to neighboring Iran to help deal with the crisis. Iran provides electricity to several towns and villages in southwest Baluchistan province at cost of around $3 million a month, said Mohammad Ashraf, a spokesman for Pakistan's Ministry of Commerce. Paying for the electricity is complicated by U.S. sanctions preventing financial transactions with many Iranian banks because of the country's suspect nuclear program. Therefore, Pakistan plans to pay for the electricity by exporting wheat to Iran. "This food supply doesn't come under international sanctions Iran is facing," Ashraf said. Iran sent Pakistan a bill for $53 million for electricity supplied up to mid-February, said Ashraf. Pakistan plans to pay by sending Iran 1 million tons of wheat. The Pakistani government on Thursday approved sending 100,000 tons of wheat as the first installment. The first ship carrying about 30,000 tons is expected to sail to Iran sometime next week, Ashraf said. Pakistan also has plans to build a pipeline to import natural gas from Iran, despite the threat of U.S. sanctions. Associated Press writers Zarar Khan and Munir Ahmed in Islamabad and Sherin Zada in Mingora, Pakistan contributed to this report.